Castleview Ridge Estates, Pincher Creek No. 9 - Here is your chance to have the perfect weekend getaway home. Located near the Oldman River Dam Castleview Ridge Estates offers a quiet recreational community ideally located for fishing, kayaking, wind surfing, hiking, and whatever else your heart desires. You are only 2 hours from Calgary, 1 hour from Lethbridge, 45 mins to Waterton, 40 mins to Castle Mountain, and 10 mins to Pincher Creek. It is a year round community that offers access to municipal water and sewer. 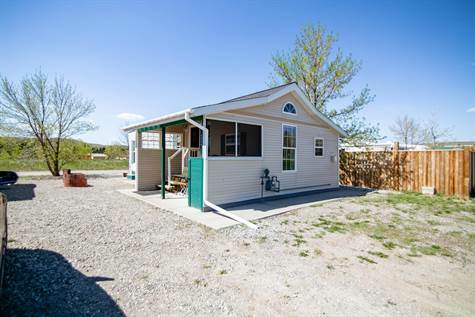 With this one of a kind park model home, you don't have to worry about hauling the trailer up every weekend. It's already here for you. Monarch, Lethbridge County - Announcing a price reduction on 11.54 Acres, a ranch. Now MLS® $276,500 - . Heritage, West Lethbridge - Announcing a price reduction on 12-762 Heritage Boulevard W, a 628 sq. ft., 2 bath, 3 bdrm bi-level. Now MLS® $190,000 - Reduced!. 1124 25 Street N in Winston Churchill is Sold! Winston Churchill, Lethbridge - The single story at 1124 25 Street N has been sold. Mountain Heights, Lethbridge - Announcing a price reduction on 177 Mt Crandell Cres W, a 1,025 sq. ft., 2 bath, 4 bdrm bi-level. Now MLS® $194,000 - Reduced!. Mountain Heights, Lethbridge - Announcing a price reduction on 175 Mt Crandell Cres W, a 1,025 sq. ft., 2 bath, 4 bdrm bi-level. Now MLS® $194,000 - Reduced!. Varsity Village, West Lethbridge - Announcing a price reduction on 13-275 Columbia Blvd W, a 997 sq. ft., 3 bath, 3 bdrm townhouse. Now MLS® $189,500 - Reduced!. Winston Churchill, Lethbridge - In an established northside neighborhood, this spacious and clean 1,104 sq ft bungalow has had many updates over the years - including windows, siding, roofing, jetted tub and more. There are three bedrooms on the main floor, another in the basement, and plenty of storage. The location is close to schools, shopping and everything else (without being stuck on the main boulevard). The large lot offers plenty of trees for privacy and ample room to house a large garage. You can just move in and enjoy the home and comfort of the neighborhood! Call Mark Kozak of Century 21 Foothills Real Estate for your chance to view and own this home. Ask how you can earn AIR MILES® Reward Miles when you buy or sell with me. 2205 6 Avenue N in Westminister is Sold! Westminister, Lethbridge - The bungalow at 2205 6 Avenue N has been sold. 219 Canyon Boulevard W in Paradise Canyon is Sold! 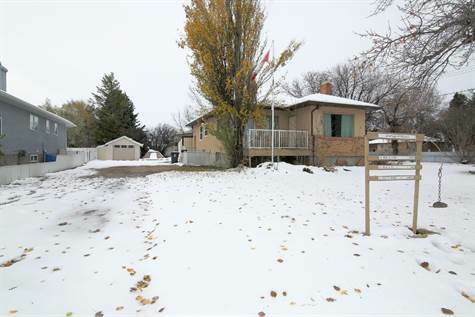 Paradise Canyon, Lethbridge - The bungalow at 219 Canyon Boulevard W has been sold. Winston Churchill, Lethbridge - Nestled in the heart of the north Lethbridge you will want to check out this 1,023 sq ft bungalow complete with 5 bedrooms, 2 bathrooms and located within walking distance to the elementary school, middle school and high school. The big bright windows give plenty of light in the open living room and spacious kitchen to entertain while the large yard provides ample room to play and garden. The roof was redone about 4 yrs ago and new siding was just done. Even the basement windows meet egress in the bedrooms. It is move in ready and ready to call home. Call Mark Kozak of Century 21 Foothills Real Estate today for your chance to view and own this home. Don't forget to ask how you can earn AIR MILES® Reward Miles when you buy or sell with Century 21. 314 3 Street in Shaughnessy is Sold! 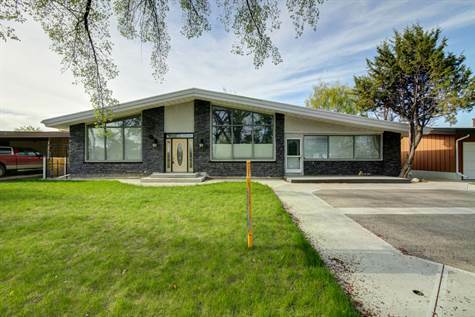 Shaughnessy, Lethbridge County - The bungalow at 314 3 Street has been sold. Henderson Lake & Golf Course, Lethbridge - Location, Location, Location!!! Nestled across from a park and golf course sits this massive home, with over 5000 sq.ft developed. This is a huge property in an incredible location. Three bedrooms on the upper level, one of which- a large master retreat with the perfect en suite; his & her sinks, heated tile floors, jetted air & water tub and bath. Main floor features an open concept with plenty of space for entertaining. Triple drive up to the front and super sized detached garage out back. Don't miss out on this rare gem!